There’s nothing that gets Laurie Evans’ juicing flowing more than a big occasion so it’s no surprise that the Sussex batsman is relishing Thursday’s game against Australia. Evans thrilled a full house back at Edgbaston in 2014 with a man of the match half-century that helped Warwickshire win the T20 Cup. There will be a 6,000 full-house at Hove for the Australian’s first match of their short tour and the 26-year-old can’t wait to test himself against a world-class bowling attack. “I haven’t played international cricket so these are the games where you find out how good you are, testing yourself against some of the best players in the world,” said Evans. “In my career I have always tended to do well in the big games, I enjoy those occasions and we will go out there and show what we can do. Evans will go into the encounter full of confidence after scoring an unbeaten 107 in Sussex’s Royal London One-Day Cup defeat to Essex on Sunday. This season he is batting higher up the order at No.5 in one-day cricket and believes the move has helped him find consistency. 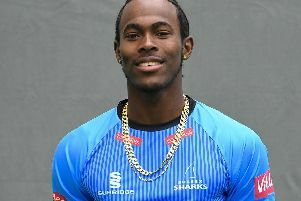 He averaged 60.75 in the competition but Sussex were knocked out after winning two group stage games. “With this role there is more time to get yourself in and play naturally before pressing the accelerator,” he said. “There’s a big difference. I have made a few starts but have got out at the wrong time so it was good to finish things off with a good score. Thursday’s game is one of just six days cricket for Sussex in June. They don’t return to action for another fortnight before facing Durham at Arundel in the Specsavers County Championship. With Stiaan van Zyl facing a lengthy period on the sidelines because of a knee injury there is a vacancy in Sussex’s top order in red-ball cricket which Evans, who only played four Championship games last season, is keen to fill.